Fifty years ago, Apollo 8 became the the first manned spaceflight to leave the Earth’s orbit. Ignited by rumors of a possible Soviet manned lunar mission, the National Aeronautics and Space Administration (NASA) launched Frank Borman, Jim Lovell, and Bill Anders into space on December 21, 1968. The men became the first humans to enter lunar orbit. 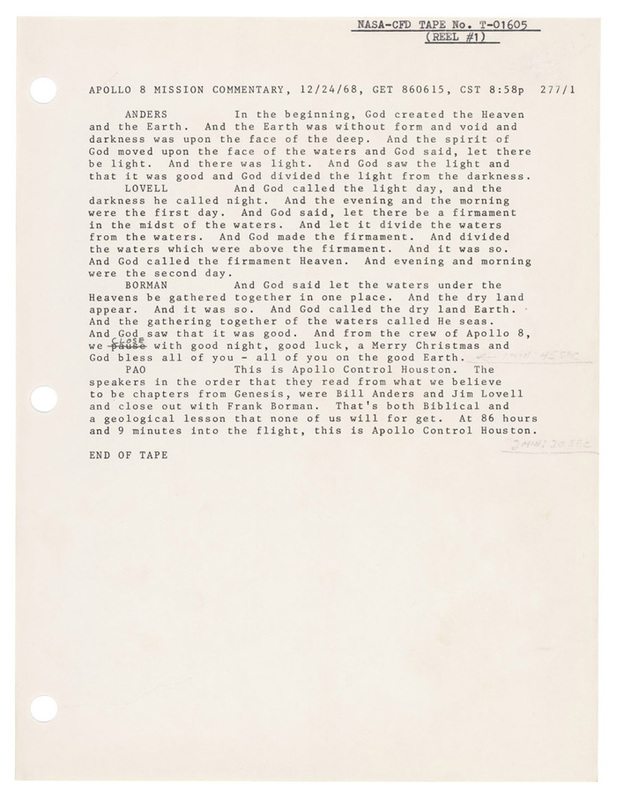 The National Archives is celebrating with a special multimedia display of ​excerpts from the Apollo 8 mission telecast on December 24, 1968, and two short documentary film screenings at noon on December 5. NASA celebrated its 60th anniversary in 2018. Explore our holdings to discover the fascinating story of the creation of this agency and the story of space exploration. Sixty years ago, on October 1, 1958, the National Aeronautics and Space Administration was established. Explore our holdings to discover more about the creation of this agency and the history of space exploration. Throughout October 2018, the National Archives hosted special programs in honor of this anniversary: an Archives Hashtag Party (using for #ArchivesInSpace) on Twitter, family activities in the Boeing Learning Center, tagging missions for Citizen Archivists, and free screenings of Above and Beyond, a new documentary film from Discovery. You can still check out our 60 space-related historic GIFs on our GIPHY channel to share with your friends on your favorite social platform. Help us make our space-related records more accessible by working on one of our four tagging missions about NASA! Explore NASA-related lessons and activities for the classroom, based on primary sources in the holdings of the National Archives. 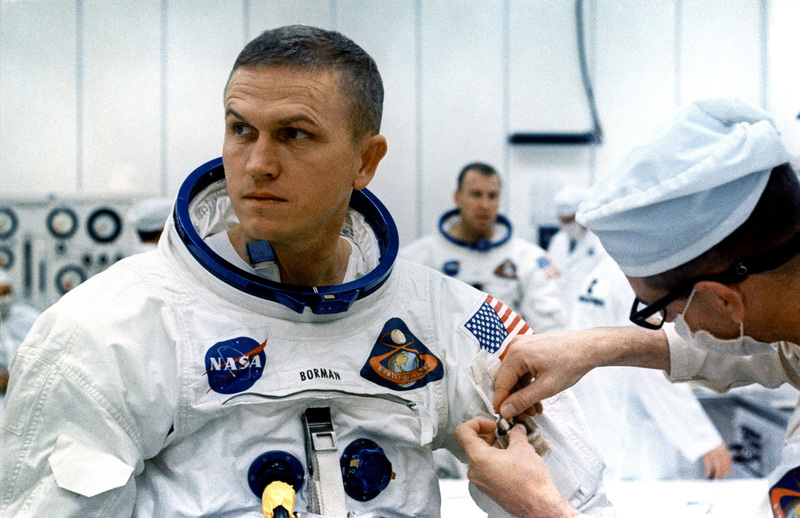 A technician places two inflight pens and a penlight in the spacesuit pocket of Apollo 8 commander Frank Borman. 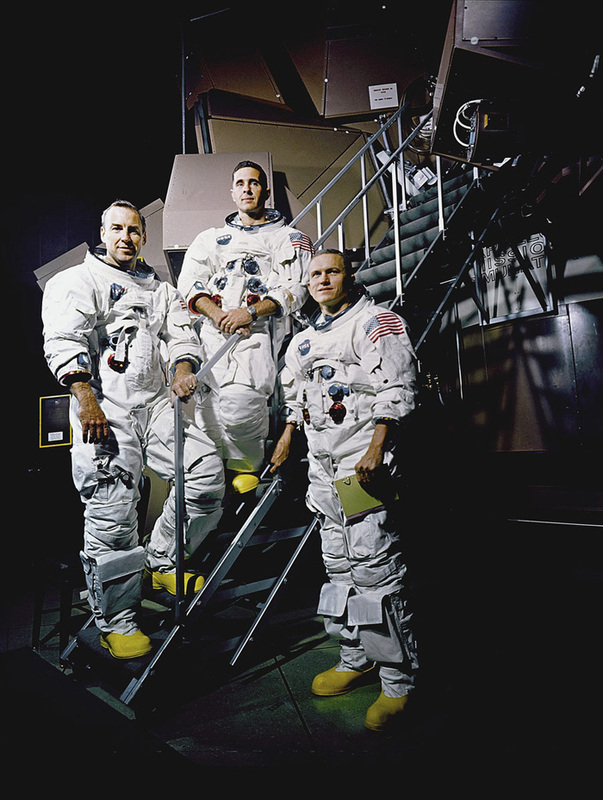 Apollo 8 crewmembers, left to right: James A. Lovell, Jr., William A. Anders, and Frank Borman photo taken November 22, 1968. 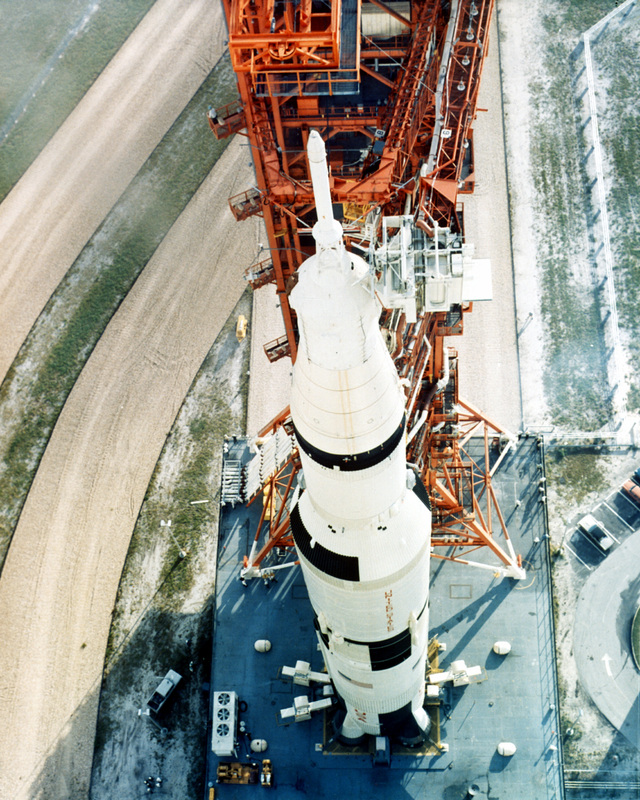 A view of the 363-foot-high Saturn V launch vehicle that will carry Apollo 8 astronauts Frank Borman, James Lovell, and William Anders into space, 10/9/1968. 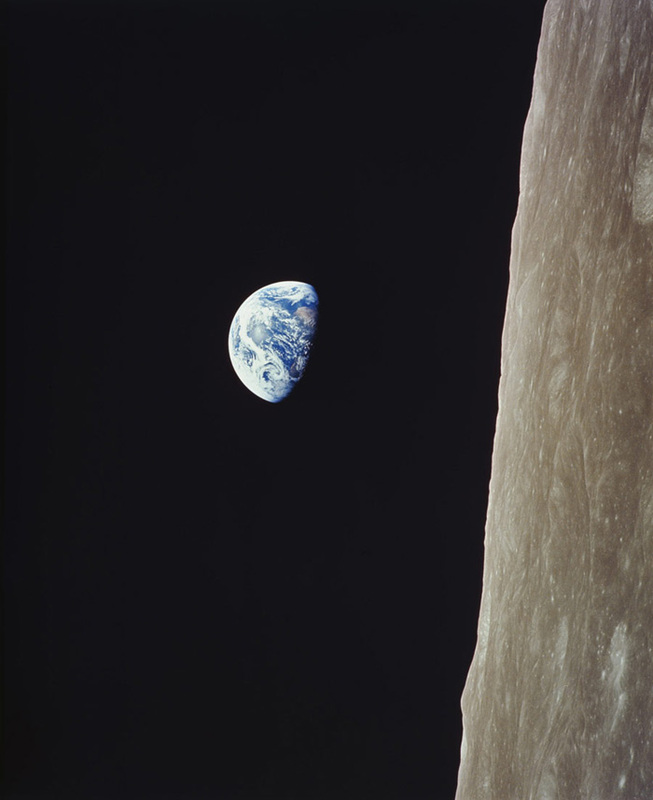 Earthrise seen from Apollo 8. 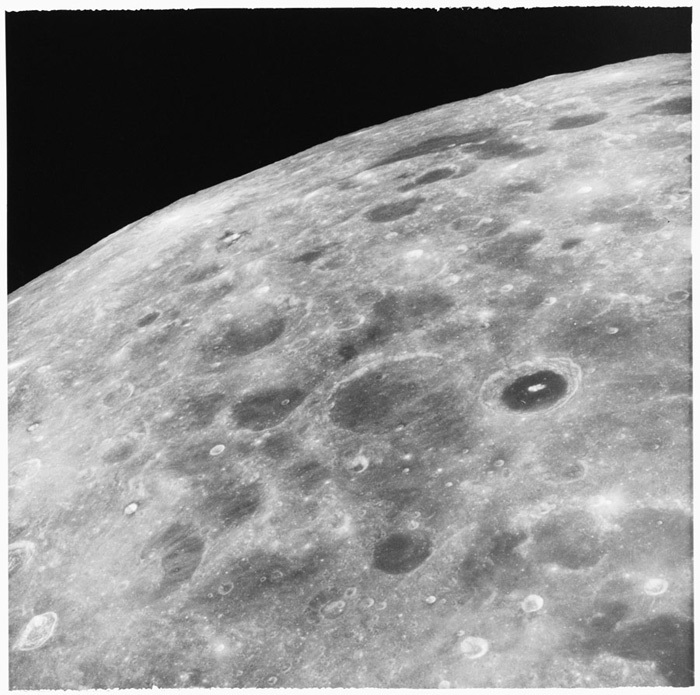 The astronauts saw the horizon vertically with the lunar surface to the right. View of the Moon from Apollo 8, 1968. 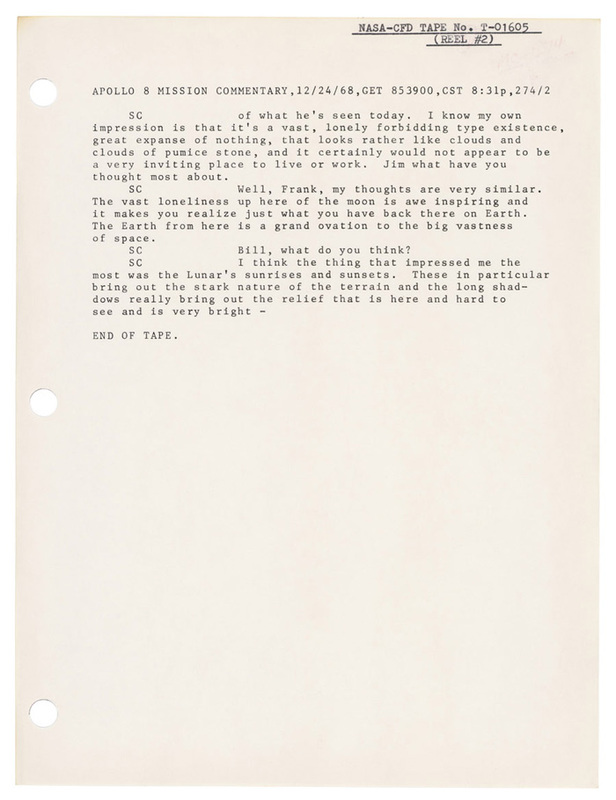 Transcript of audiotapes of Jim Lovell and Frank Borman giving their impressions of the Moon druing the Apollo 8 telecast, December 24, 1968. The crew read from Genesis during a broadcast from lunar orbit on Christmas Eve, 1968.